Following on from this previous post, the WPF and Silverlight code that I’ve been running tries to access a MeshObject ( containing a DataFeed of photos ) that the code itself creates at initialisation time. What I wasn’t sure about at all was how that’d work if I wanted to make the same data available to another person altogether. Check local mesh for “photos” MeshObject. If not present, check cloud mesh for the same. If not present, create it. If I want to share my photos with lots of other users of the same application then is that what I want? All my users will end up with their own MeshObjects with their own photos and none of them will ever see each other. So…I set about trying to figure out what the “shared data story” is. There’s a sample in the walkthroughs called MeshageBoard ( no, really 🙂 ) which helps quite a lot with this in that it shows the way in which one user can send invitations to another. In order to experiment with this, I decided that it was time to grab myself a secondary Live ID so that I could log in to Live more than once and to run that Live ID through the registration process for the Live Framework CTP ( luckily, I found that I had a little card at the bottom of my desk drawer from PDC with 2 Live Framework invitation codes on it so that I could get an invitation for my second account ). The console window on the left shows me logging in to the cloud as mtaulty@hotmail.com and then creating a MeshObject called “TestObject”. 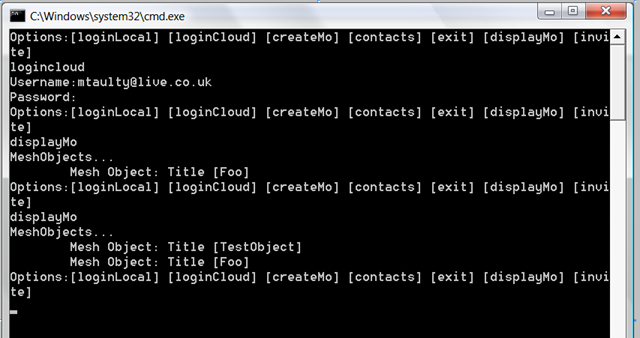 The console window on the right shows me logging in to the cloud as mtaulty@live.co.uk and first displaying that I only have one MeshObject called “Foo”. In the console window on the left, I then go and invite mtaulty@live.co.uk into that MeshObject called “TestObject”. Then ( in the background ) I (mtaulty@live.co.uk) go and accept the email invitation to the object called “TestObject” and so the next time I display my MeshObjects in the right hand window, that new object has shown up in my Mesh. Very cool – it surprised me as to how easy this was. From the code above, I only gave the invited Member a role of Reader but I could have given them more control.